Last year I wrote that Steam Complex Needed City Permission For Guys To Sleep Over. But I had no idea that a fire gutted the establishment in October of 2016. Well a year has passed and the bathhouse has re-opened, but with reduced hours. It’s new permanent location is just 480 meters away from their old location. Its new website describes ‘phase one’ of their opening hours as 10am-7pm daily, with a 3pm finish on Sundays. In addition they have 1,000 new guys buy a membership. 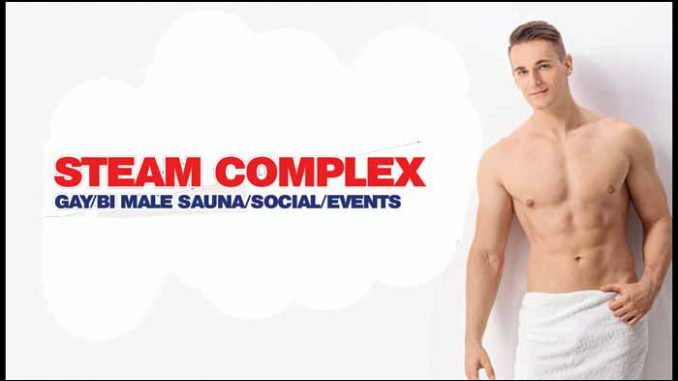 One of the largest saunas in the North of England, Steam Complex is an all-male sauna catering to gay and bisexual guys. Featuring a stunning array of facilities including 25-man sauna, spa, 3 adult cinema rooms, sun bed, private room hire and an onsite licensed bar and café with free internet, you’ll find plenty here to keep you amused throughout the day. Various events take place throughout the month – check out their website for more details. Visit between 10am and noon and help yourself to free breakfast. Delicious! Open daily, with 24 hour access from Thursday through to Sunday night. Free WiFi. Free car park. Not exactly re-opened. They’re using a ‘Swingers Club’ for a few hours each day. The comments on the Squirt listing suggest it’s not been the success that many of us might have hoped.